The Indiana Parenting Institute works to strengthen parents through education and training, thus creating a better environment for children and families to thrive. “When you’re a parent, in our mind, you’re not supposed to make mistakes; but the truth is we do, because we’re human.” – Demetra T.
For two days each week, Zero Tolerance students like Demetra gather to receive training, resources, and counseling. Demetra is one of many parents to whom the Indiana Parenting Institute (IPI) has provided unique education and training programs since 2007. 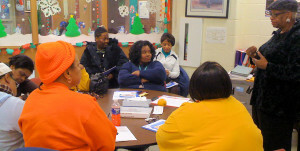 Zero Tolerance, a program that improves school attendance by educating parents about the detrimental effects of truancy, is one of many services offered by IPI to urban families. Central to all its programming is IPI’s Birth2Eighteen Parenting Course© (B2E). Developed by IPI, B2E combines both the rigor and demonstrable impact of the evidence-based Nurturing Parenting Programs® model with specific strengths-based enhancements and adaptations that have proven highly effective in reaching, and meeting the needs of, vulnerable families in urban environments – and, on their terms. B2E provides parents and caregivers with the latest foundational relationship strategies and techniques proven to enhance parenting outcomes for children ages zero to 18. In addition, B2E helps young parents such as Demetra by giving them access to workforce/career readiness training, crisis support, and literacy training. As a stand-alone offering, B2E lasts eight weeks. Parents discuss how to address bullying, aggression, disobedience, and rebellion. Each session lasts two hours and is presented in an informal setting designed to make learning parenting strategies easy and enjoyable. This conversational style has proven to be a key method for approaching the urban demographic, who may come into sessions with bad school experiences. A classroom atmosphere with a teacher lecturing just doesn’t work and it’s not comfortable for most participants. In fact, the course has proven to be very effective: 89 percent of the families that IPI serves exhibit improved parent-child relationships and report decreased home stressors as a result of program participation. 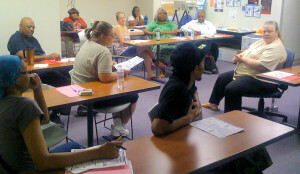 B2E’s first three sessions focus on self-esteem and communication. In this unit, parents begin with their own self-assessment, self-image, and self-appreciation so they are then desirous and able to acquire and implement those parenting techniques needed to help their children develop a positive self-image and communicate feelings in an honest, appropriate manner. The second part of the curriculum focuses on behavior and conflict management. This unit unpacks the choices children make and the consequences of those choices. The final third covers a handful of topics including values, safety, and resilience (effectively handling life’s issues). 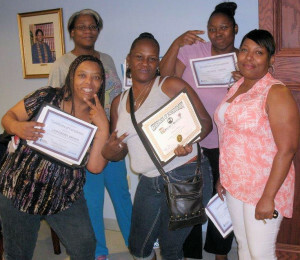 By the end of the program, parents have learned many parenting and life skills. They are also given access to community resources that improve family relationships and encourage children to lead productive and successful lives. “It’s not about ‘follow our program,’ but about using the resources that are out there to move these families into their definition of a quality life,” explains Jená Bellezza, Vice President of Strategic Partnerships & Branding for IPI. Bellezza is one of four full-time staff working to fulfill IPI’s vision of ending the familial maltreatment of children through effective and responsible parenting. Parents become eligible to enroll in B2E in a few different ways. Parents who are issued a citation for parental neglect are required by law to appear in court. During this hearing, they are offered a choice: pay a fine or enroll in a B2E course. IPI partners with Project Rebuild, an Indiana truancy program that ensures that parents who choose to enroll are referred directly to their program. An additional partnership with the East Chicago Housing Authority allows IPI to offer B2E to parents who have committed housing infractions as observed during housekeeping evaluations. In such cases, the parent is presented a similar choice: immediate eviction or enrollment in a B2E course. In addition to programs like Zero Tolerance and B2E, IPI also seeks to heighten public awareness of the issues local families face through advocacy, professional development trainings, speaking engagements, media exposure, and community events. These awareness efforts all work toward the purpose of creating a better environment for children and families to thrive. “We develop trust with parents and help them move in the direction they want,” Bellezza said.